A book launch extravaganza for Encyclopedia Volume 1 A-E everyone’s favorite new pink and turquoise encyclopedia of fiction, prose and art! Readings, Music, Shenanigans and Live Cross-Referencing Action!!! Encyclopedia Vol 1 A-E is the first of 5 volumes of The Encyclopedia Project, the brainchild of Tisa Bryant, Miranda F. Mellis and Kate Schatz that presents new and innovative fiction, visual art and cross-genre work and borrows the design and structure of the reference book. 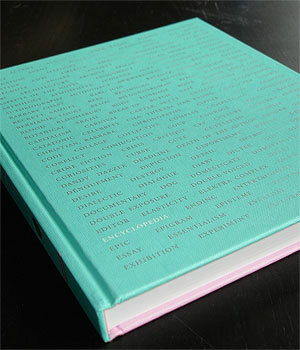 The Project will ultimately span A-Z; Encyclopedia Vol 1 A-E covers A-E and is a fully cross-referenced hardbound 336-page pink and teal book. 114 writers and artists contributed by creating encyclopedia entries for hundreds of words, from Anxiety to Borges to Celebrity to Dialogue to Elektra Complex. Smart, strange, entertaining and a little bit crazy, Encyclopedia Vol 1 is a vibrant romp through narrative and genre that features short stories, essays, paintings, video stills, lists, email exchanges, plays, photography, a rebus and more by a stunning cross-section of contemporary writers and artists, including Laylah Ali, Rebecca Brown, Zak Smith, Carole Maso, Anna Joy Springer, Samuel Delaney, Fred Wah, Eileen Myles, Carolee Schneemann and Harrell Fletcher.